In this superhero adventure series, Kara Zor-El, the cousin of the Kryptonian hero Superman, must learn how to use her own super powers to fight against evil. The series is part of The CW's stable of DC Comics-based titles, and it sometimes features crossovers from the other series. Supergirl , The Flash , Green Arrow and Superman engage in the battle of their lives. Supergirl learns the true depth of Selenas (recurring guest star ANJALI JAY) nefarious plan for Earth. While Jonn prepares to say goodbye to his father, Supergirl, Mon-El and Alura (reccurring guest star ERICA DURANCE) must devise a plan to stop Selena before she gets to Earth. Kara makes a major life decision. Meanwhile, J'onn finds out that special DEO-caliber guns have hit the streets of. When Tanya, a disciple of Coville's, escapes from what's left of his cult, she gives Kara and James a journal that could hold the key to saving Sam. Someone learns Guardian's identity and threatens to expose James if he doesn't do what they ask. James contemplates what it means to be a black vigilante without a mask. When Reign starts hunting Ruby, Supergirl and Alex work together to keep her safe. Supergirl and J'onn look to Sam's mother (guest star Betty Buckley) for advice on how to stop Reign and come away with some shocking news. Psi, a thief with psychic powers, attacks National City. Able to immobilize people by tapping into their worst fears, Psi proves a formidable opponent for Supergirl. Meanwhile, James and Lena are at an impasse, and Samantha starts her new job at. They're not married yet, though. Don't expect it to star Melissa Benoist, though. The CW series will be breaking new ground in the fall. Turns out that Supergirl can sing, too. The network will debut new episodes of all its series in a single week. The heroine's cousin will visit National City once again. Supergirl has migrated from CBS to The CW for its second season, and that's not the only big event in store for the series this week. Supergirl is currently available to watch free on The CW and stream on The CW. 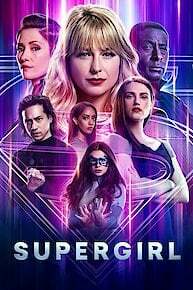 You can also stream, download, buy, rent Supergirl on demand at Netflix, Amazon, Vudu, FuboTV, FandangoNow, Google Play, DIRECTV NOW, iTunes online.